The first 718 Session was in October, 2002. Fifteen years ago! It's really unusual for a party to run that long. How did things get started? Why "718 Sessions"? About six months before that, me and Benny Soto tried our first party together at Halcyon, which then was located on Smith Street. It went so well that we got together to talk about doing a monthly party. The first one was on Water Street in Dumbo, Brooklyn. We weren't even thinking long term, we just wanted to try a few parties together and see how they went. The name 718 came from the Brooklyn telephone exchange. "718 Sessions" seemed to fit well, and even when the party moved to Manhattan, "718 Sessions" stuck. "212 Sessions" just didn't seem to cut it! I traveled a lot for DJing, so I couldn't commit to recurring date every month, so we kept it loose—approximately once a month, which we thought worked out pretty well, more like a special event than something so predictable. I had just come off six years of weekly Body & Soul parties at Club Vinyl, so there were a number of dos-and-don'ts I brought from that. I think our shared goal, besides just having a dope party, was having a diverse crowd that came for music first, and a great sound system. And a welcoming, easy-going atmosphere that was affordable and positive. As you know, a party is only as good as the folks attending. What makes the crowd at 718 so special? From the start, it was a very diverse group of people. Very quickly, this was the party that I felt most musically free in. There is this great group of people that were regulars at The Loft, The Garage, Gallery, Shelter, and Body & Soul. Obviously not young in age, but their energy is through the roof! These are the people that line up at opening and when the younger people show up, it's this crowd that shows them how to get up and starts this whole great mix. Of course, a dedicated group of dancers comes back again and again because they trust the DJ. How would you describe the mix of music you play at the 718 Sessions? In what ways is it different from what you might do elsewhere? This is the party I feel most musically free in. I've spent my whole life in NYC, and this is a true New York crowd. Often when I play certain songs, you can tell, at certain parts, it's a shared experience. A New York experience. I get some great crowds around the world, but this is unique and my favorite crowd to play for. I know you are sometimes asked about doing a 718 Sessions outside of New York City, but you've turned down the offers. Why? 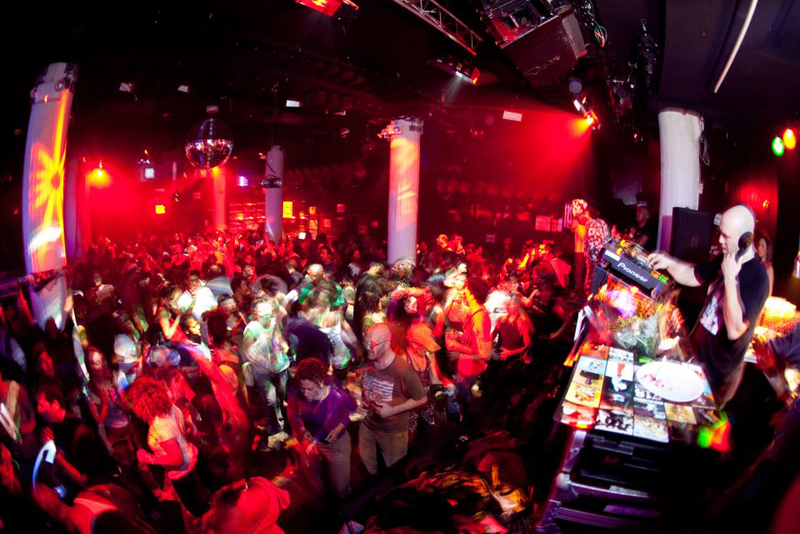 718 Sessions is the crowd that comes to these parties in New York. Unless they can come with me… I don't care what you call it, but it ain't gonna be a 718 Sessions party! There are behind-the-scenes folks who contribute a lot to making the party a success. Can you tell us a little about them? Benny Soto has a great, easy-going energy, but also a very keen sense of people and club life. It's been a great pleasure working together all these years. It was really his first party as a promoter. Now, he's a top New York promoter, but you can tell 718 Sessions has always remained special to him. He puts a lot of care into it and it shows. People really love him! There would be no 718 Sessions without him. I've worked with Ariel over 25 years. He's just the best light-man out there—He's more like a DJ than a technician. And then there're others, like Go, who has helped compile the playlist of every party for most of these years. And you have people like Mark Rivas and Carmen Valentine at the door, they're the face of the party as people enter, and make everyone feel welcome and special. Although every party is special, there must have been a few moments that are particularly memorable. Can you describe any that come to mind? There have been so many incredible moments that they kind of blur together, so they're more like memorable parties. Consistently, our New Year's Day parties are extremely special, also our annual 718 Sessions Boat Party. But over all there have been so many incredible parties. There've been voguing battles and runways, and times where the crowd almost sings the entire song. We've had some incredible impromptu performances, from people like Ann Nesby of Sounds Of Blackness, Leroy Burgess, D-Train, Joi Cardwell, Róisín Murphy of Moloko. Josh Milan and Blaze performed at our very first 718 Sessions. We've had a Brazilian carnaval, and a cascade of incredible guest DJs: Frankie Knuckles, Osunlade, Joe Claussell, Timmy Regisford, Sting International, Kenny Dope, Honey Dijon... just to name a few. Like many great DJs, you are fond of telling a story with your selections. There is a "message in the music." When I started DJing, everybody paid attention to the words, and all the DJs I knew told a story with the songs they played. It's something I do too, but not consciously. It's just the way I think about music and the way it comes out. Afterwards when I look back, there's a very clear story, mostly of love and positivity. People do notice. I don't have a particular song to point to, there are just too many. But I love when songs are well-written and the words really talk to you. What are you looking forward to in the future with 718 Sessions? How long can this go on in a changing New York City? I love what it is, so it seems natural that it will continue. I never really thought of it in terms of expectations of how long it should last—It still feels great, fresh, special... I can never get enough of that. The city is changing, and has changed: It looks like Brooklyn is the new center of club world. And in this 15 years, music and music culture has seen many changes. But I've never been one to follow trends. I just play the music I love for a group of people that are feeling the same way. 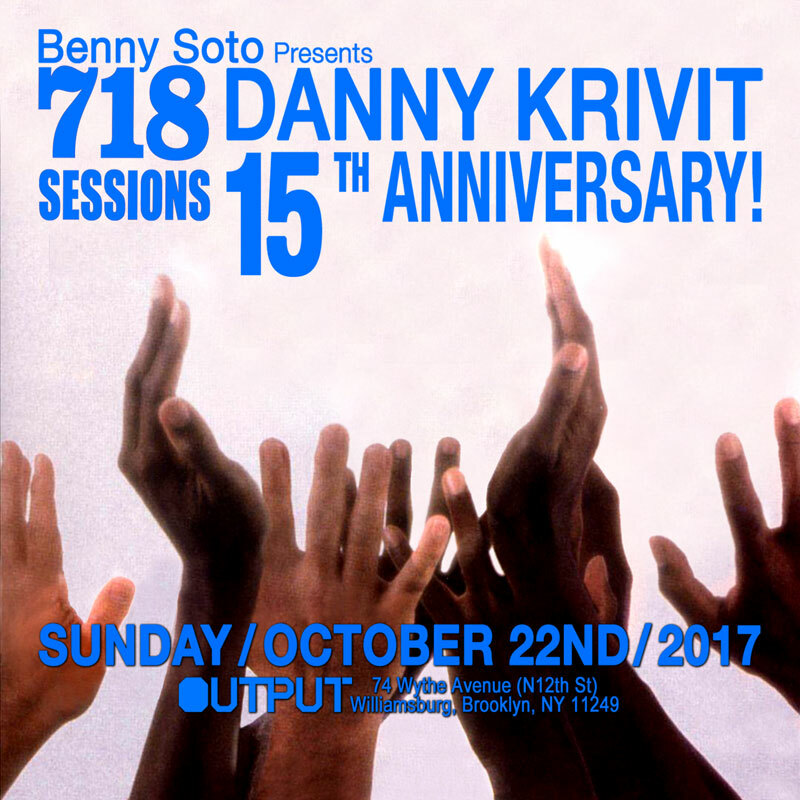 Sunday October 22nd Danny Krivit 718 Sessions 15th Anniversary!